Future Music Festival only just brought the Australian summer festival season to a close with the likes of The Prodigy, Drake, Hilltop Hoods and Darude, but organisers have announced that the event has been axed and will not return in 2016. ", " a statement issued today reads. "It's been a difficult decision to make but in the end travelling the festival in its current form across Australia simply doesn't make financial sense anymore." "We want to thank you all for your support over the years - we're grateful for all the unforgettable times we've shared together." An additional media release from promoters The Mushroom Group - who bought into Future just two years ago - explains that the decision to axe Future's flagship Australian event is due to declining ticket sales and rising costs of staging the touring festival, which annually visits Sydney, Perth, Brisbane, Melbourne, and Adelaide. "Despite the considerable critical acclaim of the 2015 festival, the last two years of ticket sales for the festival have underperformed, meaning Future Music Festival will not be returning in 2016." "Mushroom Group share the belief expressed by a number of promoters globally that the day of the large scale travelling festival in its current form is unfortunately numbered." The historic Melbourne-based music company says they now focus on their Frontier Touring arm and continue with the rest of their live music folio: including the A Day On the Green outdoor concert series, and boutique festival Sugar Mountain, which staged a return this year with a new venue and eclectic line-up of bands and visual arts. 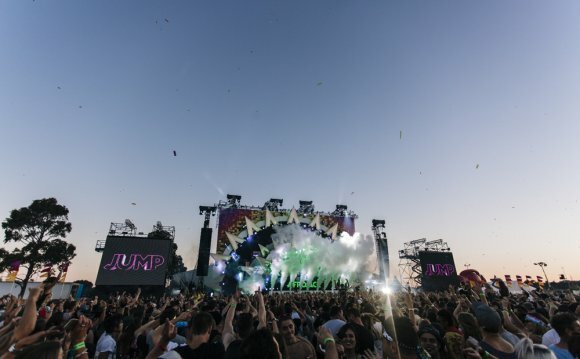 Meanwhile, Future Music's spin-off event for under 18s, Good Life is set to continue and Mushroom boss Michael Gudinski says they're developing a new festival concept to replace Future Music Festival on the music calendar. "The decision to discontinue Future Music Festival was not made lightly, " Gudinski said.
" A point came though where it simply no longer made sense to continue. We believe in the festival industry in Australia and plan to announce an exciting new festival concept in the coming months." With Big Day Out's US owners unclear on its status and Soundwave festival downsizing, and now Future Music being shelved, Australia's summer music festival season is going to look very different in future.